Hailed as a "holy grail of recording" by Recording magazine, Auto-Tune is a multi-platform plug-in that corrects intonation problems in vocals or solo instruments, in real time, without distortion or artifacts, while preserving all of the expressive nuance of the original performance with audio quality so pristine that the only difference between what goes in and what comes out is the intonation. Over a typical pitch correction range, it is simply not possible to tell that a sound has been processed, except that it is perfectly in tune. Auto-Tune is used daily by thousands of audio professionals around the world. Whether to save studio and editing time, ease the frustration of endless retakes, to save that otherwise once-in-a-lifetime performance, or to create striking special effects, Auto-Tune is the tool of choice. Most common pitch problems can be corrected by Auto-Tune's Automatic Mode. Automatic Mode instantaneously detects the pitch of the input, identifies the closest pitch in a user-specified scale (including minor, major, chromatic and 26 historical and microtonal scales), and corrects the input pitch to match the scale pitch. A Retune Speed control lets you match the retune rate to virtually any performance style. Evo Voice Processing Technology: In 2008, Auto-Tune Evo introduced Antares’ seriously evolved Evo Voice Processing Technology, setting a new standard in pitch detection, pitch shifting, and formant processing performance. In the intervening years, Evo Voice Processing Technology has been integrated into Antares’ full line of vocal processing tools. Now, with Auto-Tune 7, we are introducing the second generation of Evo Voice Processing Technology, offering even more natural (if you want it to be) pitch shifting and throat modeling over a wider transposition range. 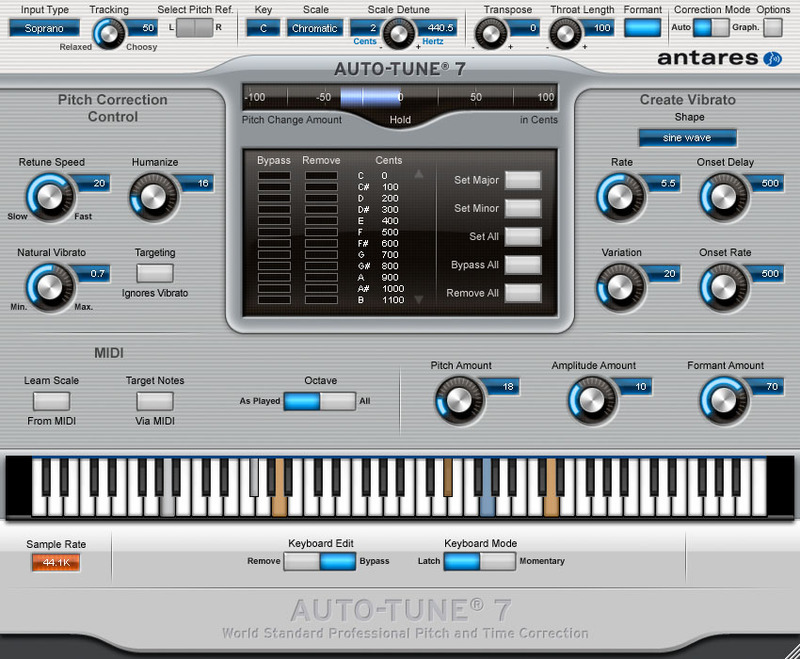 Enhanced Graphical Mode Adjust Vibrato function: Auto-Tune 7’s new Adjust Vibrato let's you modify the depth of any natural vibrato in the original performance. And since it is additive, acting on any already existing correction object, you are free to work on pitch correction and vibrato adjustment in any order desired. Bugfix for a problem preventing window resizing in the Options dialog from being memorized in some hosts. Bugfix for a problem in GarageBand where attempting to adjust a control would result in dragging the entire GUI. Posted by Alex on Wed, 04/09/2008 - 23:22.